Join us for the Brain IDEAS Symposium August 5th in Denver! 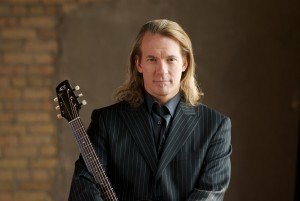 Meet the Artist – Billy McLaughlin has been changing people’s idea of what an acoustic guitar can sound like since the 1980’s. He is recognized as an innovative performer and composer who embraces the advantages of acoustic guitar amplification, unorthodox techniques and altered tunings while celebrating a gift for melody. His enormous yet fluid acoustic guitar tone has carried him around the world, to Billboard’s Top-Ten Chart and most recently through a devastating medical disorder called focal dystonia. 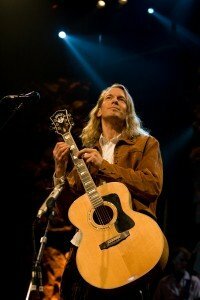 McLaughlin has had to re-learn the guitar left-handed and is in the early stages of what might be described as “one of the great musical-comeback stories of all time.” His story is the subject of an award-winning documentary film called Changing Keys – Billy McLaughlin and the Mysteries of Dystonia. The Past – A serious professional in his teens, McLaughlin left his home and rock band in Minneapolis for the University of Southern California guitar department where he became interested in minimalist composers Phillip Glass and Steve Reich. Employing what would become his signature style of placing both hands on the fretboard, McLaughlin began composing for his first release using a technique of “hammer-ons” and “pull-offs” that create a harp-like effect on the acoustic guitar. This unusual approach led Billy to extensive national touring earning multiple NACA Campus Entertainer awards. In 1995 McLaughlin signed a multi-album international contract with Virgin Records label Narada whose first release, Fingerdance, peaked at #7 on the Billboard charts. Hundreds of shows a year and another release deep into the contract with Narada, he began struggling with his hands – something felt “off” and it was getting worse. For two years he struggled with a mysterious and unrelenting condition of unexplainable muscle spasms and contractions. Shockingly as symptoms grew worse he could no longer perform most of his own repertoire. In 2001, Billy was diagnosed with a neuromuscular disorder called focal dystonia. The diagnosis was confirmed at the Mayo Clinic. Going against doctors’ recommendations to quit music and look for other work, McLaughlin focused on his songwriting and returned to his rock band which was less demanding for his hands. Despite releasing his ensemble’s best recording, Finally – Live! (2002) it was clear that focal dystonia had ended McLaughlin’s career as a virtuoso guitarist. The Challenge – Feeling utterly lost without his music and not willing to give up, McLaughlin began the unlikely journey of teaching himself to play in his signature style, left-handed! Late in 2004 a documentary film crew began following McLaughlin’s desperate attempt to regain his career. Warned by doctors of a higher likelihood for developing focal dystonia in his remaining good hand, McLaughlin chose to press on towards an ambitious goal he had yet to achieve – to perform and record a new project with a string orchestra. In January 2007, McLaughlin published a limited release of Into the Light, a concert recording of compositions for acoustic guitar with string orchestra. This collaboration with Grammy nominated arranger, Eugenio Toussaint, is McLaughlin’s first recording as a left-handed guitarist. In 2008, Coming Back Alive, a companion DVD shot by volunteers from the WWE broadcast crew capturing the historic performance was completed and released via direct marketing. The Future – Billy’s story is truly an inspiration! The Dystonia Medical Research Foundation (Chicago, IL) has named Billy their first Ambassador for Public Awareness and for his efforts McLaughlin has just been awarded the international 2010 Leadership in Public Neurology Award at the American Academy of Neurology conference held in Toronto. Previous winners of the award include Paul Allen, Julie Andrews, Leon Fleischer and Michael J. Fox. The documentary film, Changing Keys, chronicling McLaughlin’s physical and emotional struggles, the medical mysteries of dystonia, and this amazing musical come-back has been awarded top-honors at the Houston International Film Festival. This independently produced film will begin airing on over 50 major market PBS stations in June 2010. McLaughlin is a featured speaker at the TED conference in Atlanta (May 2010) and is touring internationally including China, the Philippines, India, Europe and extensively throughout the US. “Many people fail because they quit too soon.” reads the fortune cookie saying that McLaughlin taped to his dashboard in 2001 – it remains there to this day.